Germain Henri Hess was born on August 7, 1802 in Geneva, Switzerland. His family moved to Russia when his father, an artist, became a tutor for a rich family. He studied medicine at the University of Tartu, obtaining a M.D. in 1826. 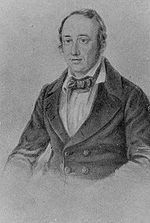 In school he also studied chemistry and geology and upon graduation traveled to Stockholm, Sweden to study under the chemist Jons Jakob Berzelius. Although Hess spent only one month in the lab of Berzelius, they became life-long friends and correspondents. On his return to Russia, Hess took part in a geological expedition to the Urals. After the expedition Hess set up a medical practice in Irkutsk where he remained for two years. In 1830 Hess moved to St. Petersburg where he began teaching chemistry and doing research. Later he became a professor at the St. Petersburg Technological Institute. He remained in St. Petersburg for the remainder of his life. Hess is most famous for the chemical law that bears his name: Hess's Law. The law is that the enthalpy of change for a chemical reaction that is carried out in a series of steps is equal to the sum of the enthalpies of change of each of the steps. Enthalpy is the heat generated or lost by a chemical reaction. Hess's law allows for the calculation of how much heat will be released or absorbed by a chemical reaction by summing up the enthalpies of each of the steps of the reaction. Hess's Law was an early law in thermochemistry, the study of energy and heat in chemical reactions. Other discoveries made by Hess include the discovery that sugar when oxidised yields saccharic acid. The mineral Ag2Te is named Hessite in his honor. Hess wrote the chemistry textbook that was the standard Russian chemistry text for several decades. He was forced to retire due to failing health in 1848. Hess died in St. Petersburg on December 13, 1850.